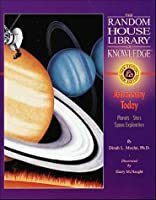 From the Random House Library of Knowledge comes a brand-new edition of the backlist favorite Astronomy Today. With a totally updated text, additional photos, and a fresh new cover, this beautiful, basic astronomy book incorporates the latest discoveries and ideas about our solar system and what lies beyond. The workings of telescopes, rockets, astronaut missions, and robot spacecraft are explained, and there are easy-to-read star maps for beginning stargazers. About Dinah L. Moche (Author) : Dinah L. Moche is a published author of children's books and young adult books. Some of the published credits of Dinah L. Moche include Astronomy: A Self-Teaching Guide, Sixth Edition.